This badge was issued to Gerard Luechinger on 01 Jun 2017. The Enterprise Storage Sales Specialist identifies opportunities for business and generates/qualifies demand using a consultative approach. They determine and effectively uses available tools and resources to determine and sell storage solutions that meet customer needs and requirements. 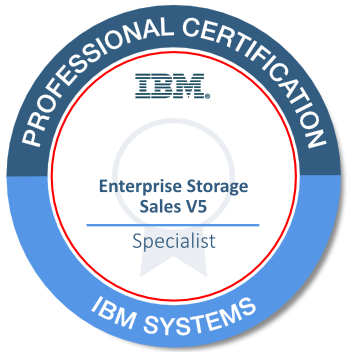 The Enterprise Storage Sales Specialist has a broad knowledge of the features, functions and benefits of IBM enterprise storage solutions, IBM Spectrum Storage, and knowledge of competitive solutions.